An Attitude of Gratitude is a principle that is not only ubiquitous but profoundly simple. 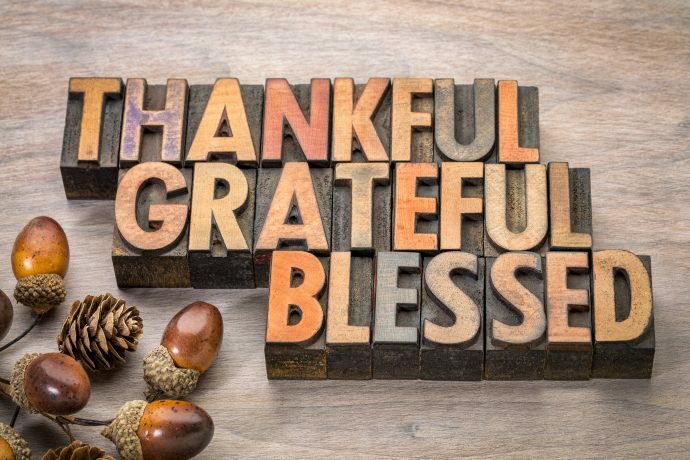 Exercising a posture of thankfulness is a lifelong and daily practice, but it is reaffirming to have a holiday and entire month devoted to the art of thanksgiving. We know that thanksgiving is vital when we reflect on Psalm 100:4. Know that the LORD is God. It is He who made us, and we are His; we are His people, and the sheep of His pasture. Enter His gates with thanksgiving and His courts with praise; give thanks to Him and bless His name. The gateway or portal to coming into God’s presence begins with giving thanks. There are some seasons in life when it’s difficult to find one thing to be grateful for, and there are other times when one could fill a notebook with a gratitude list. But it’s always easy to give thanks to the writers, artists, and musicians who create music that lifts our hearts in praise and through their words, bring us closer to God. We are also incredibly grateful for churches and ministries that obtain licensing and pay royalties that support creatives. For us at CCS, I’d like to explain why we believe God has such a greater and more magnificent purpose for the Church to “honor copyrights” than we can possibly imagine, and how this purpose helps GIVE MUSIC LIFE. We believe the higher vision and greater purpose for honoring copyrights is the calling the Church has to support songwriters and authors of creative works. Because God is the Creator and we are created in His image, and therefore designed to be creative, God wants to pour out a rich blessing of new and anointed songs and creative expressions. Throughout centuries prior to the Copyright Law, musicians and artists have traveled a bumpy road striving to find means to support their vocations. Few have flourished and many have garnered very little income for their work, some dying in poverty. There was a tremendous creative outpouring unleashed in certain European cities and countries during the Renaissance period (14th – 16th century) in a cultural economic environment that was void of Copyright Law but promoted by patrons, like the Church, the Pope and prominent families, like the Medicis. Today’s cultural economic environment is quite different, but one thing is clear, songwriters must have regular income in order to devote themselves wholehearted to their vocation…making music. There is a unique relationship and opportunity between today’s Christian community and songwriters. There is a direct pipeline or conduit of steady revenue that is flowing from the Church to songwriters because of music companies and innovative annual blanket licenses that have been developed by businesses with a heart for worship and music ministries. In the 1980’s most worship songwriters had day jobs. Some were fortunate enough to have church music minister positions, but many were carpenters, software programmers and sales reps, etc. It was hard to make a livelihood from writing music…it was a passion to be kindled at night or whenever the time could be found. When unit sales for popular worship recordings skyrocketed in the mid-80’s, song royalty payments became a surprising source of income for some writers. I distinctly remember a phone call from the author of “Give Thanks”, who explained through tears how grateful he was to receive a recent royalty check, because it literally put food on the table and paid for repairs to his family’s only car. Henry Smith’s song later rose to #1 on the CCLI charts, and continued to bless his family. As worship recording royalties grew and licensing began to take hold in churches, consistent revenue streams encouraged some writers to take the plunge and devote themselves wholeheartedly to their calling. Great art does not happen accidentally. When music flourishes there is a cultural economic terrain in which songwriters thrive. The next time you buy a church music license, like CCS’s PERFORMmusic Facilities License or WORSHIPcast Streaming License, or pay an invoice for music rights, you may want to take another look at the transaction you’re making. It’s a tremendous opportunity to support songwriters, who in turn will bless your church with new worship songs that proclaim the Gospel, touching and transforming hearts. Churches play a vital role in GIVING MUSIC LIFE and for this, we are forever thankful. Susan Fontaine Godwin is CCS’s Founder/CVO, an educator and long-time member of the Christian arts community with more than 33 years of experience in the Christian media industry, church copyright administration and copyright management. Susan is an author and speaker and frequently writes for several Christian magazines and online publications. She serves as an adjunct professor at the University of Mobile.